This article is about the last non-boss level of Donkey Kong Country. For the Mario Party and Mario Party 2 minigame, see Platform Peril. Platform Perils is the thirty-third level and final non-boss level in Donkey Kong Country. It is also the final level of the Chimp Caverns area. In the Game Boy Color version of the game, this level is the thirty-fourth level, as the result of the remake's new level, Necky Nutmare. It is the final area of Chimp Caverns in all versions of the game. In the European version of the game, there are only TNT barrels offered to defeat the gray Krusha enemies. In this walkway level, the Kongs face several challenges. The main obstacle here are the many black, moving platforms scattered all over the level. Each of these platforms has a white arrow painted on them, and wherever the arrow is pointing is where the platform moves upon being landed on. As a result, the heroes are able to navigate over many abysses with these platforms. The platforms are sometimes guarded by strong foes, namely Klumps and Krushas, and even when these enemies are not on the platforms, the Kongs must avoid standing on the platforms too long because the objects fall after they move for a short amount of time. Other enemies that attempt to attack the Kongs here are Zingers, Neckies, Gnawties, and Armies. Additionally, this is the only level to feature gray Krushas, besides Necky Nutmare, a level exclusive to the game's Game Boy Color version. The Kongs begin the level on a set of long scaffolds that also support a barrel and a Krusha. A black platform floats in an abyss ahead that begins to pull them to a slanted platform when landed on. The primates are attacked by an Army as they walk up the pathway, which is followed by another scaffold that holds another Army, a barrel, and the level's first DK Barrel. Two black platforms float in an abyss immediately after here that can take them over and up to another set of scaffolds with a trio of Klumps on them. A trail of bananas to the right of the scaffolds with the letter K between them leads the heroes down to a black platform that can pull them back upwards. Two more black platforms are ahead, with a Zinger before each of them. The first platform carries them downwards, and then the second one carries them to a long scaffold after a Zinger. Another scaffold floats near here with a pair of Armies on it. The Kongs miss a tricky platform. This is followed by a wide abyss that can be crossed with the help of a black platform that moves upwards when landed on. A small scaffold with two more black platforms next to it in another abyss is after this pit. A Zinger flies around both sides of the two platform, which both descend and then fall when touched. The primates can find two scaffolds holding some Armies ahead of here. An abyss follows the scaffolds, but it can be crossed with the use of a black platform that moves downwards when touched and a Necky that they can bounce on. On the other side of this pit, the duo can find two large scaffolds with a smaller one hanging above them that supports two Armies. An abyss nearby consists of four black platforms that move downwards when the heroes land on them, and several Zinger fly among each of them. After passing the abyss, the heroes reach a small scaffold holding a barrel that is followed by two groups of two scaffolds with Armies on them. A smaller, slanted scaffold hangs after these platforms, and it is followed by a black platform that pulls the heroes downwards to the letter O and another scaffold that hangs under the level's Star Barrel, which is orbited by a Zinger. After passing this barrel, the primates reach a large abyss that can be fully crossed with a black platform that moves to the east when landed on. As they ride along it, they travel under another black platform with a DK Barrel above it. This platform moves downwards when landed on. The primates soon make their way onto a small scaffold holding an Army. A trail of bananas next to here leads them down onto a black platform with a Gnawty on it. This platform pulls the two friends east past a Zinger who orbits the letter N. After the primates ride on another black platform that pulls them eastward nearby, they can reach a platform that carries them north, which supports a Gnawty. Another black platform with a Gnawty on it can be reached with the previous platform. It guides the heroes to another black platform holding a Gnawty. This platform pulls them to the east, where a Klump can be found walking on a black platform that falls when landed on by the Kongs. They can find a slanted scaffold immediately after the enemy with another Klump on it, who is followed by a tire sticking out of a smaller scaffold. It can bounce them to another scaffold holding a tire, which can then help them reach a wide abyss containing four black platforms that fall when landed on by the Kongs. Gnawties walk along each of them, and the primates can avoid making the platforms drop by bouncing on these foes. After crossing the abyss, the heroes reach a pair of scaffolds, both supporting a barrel, with a Zinger between them. Donkey Kong prepares to hurl a barrel at a gray Krusha. Another abyss follows the scaffolds, and the primates can only cross it with the use of a black platform, which is blocked by a gray Krusha, whom the Kongs can only defeat by hitting it with a barrel. On the small scaffold after this pit, a sign indicating that the level is almost over can be found. In another huge abyss to the right of here, a black platform that travels east when landed on can be discovered next to a Zinger. The platform pulls them past a trail of bananas onto another platform that leads them farther east once activated. The platform supports barrel, which must be used to defeat a gray Krusha blocking the next platform located nearby. This platform can guide the duo upwards to a tire, which can bounce them onto another platform that pulls them farther upwards when touched. A barrel sits on it, which must be used to defeat a gray Krusha standing on the next platform. Once the primates get on this platform, they are guided to the east again, where they find another platform holding a barrel. A Zinger flies in front of the platform, which begins to pull them back downwards when landed on. Soon, the Kongs encounter another gray Krusha on a black platform that moves to the east when touched. The primates can use the previously mentioned barrel to defeat it and progress onto the platform, which leads them to another platform holding nothing but a barrel. This platform falls down when landed on, forcing the Kongs to continue on the previous platform. A Krusha stands on the next black platform, but once the primates defeat it, they can safely reach it to be taken towards a tire. This tire can help them get onto another platform that can pull them to the west, where the letter G and the next platform can be discovered. This platform, supporting a barrel, can be used to travel to the east, where a Gnawty can be found on a platform that descends when landed on. 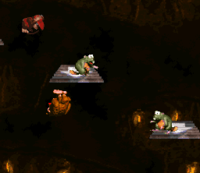 A long set of scaffolds are immediately after this enemy, leading the heroes past a Klump towards the level's exit sign. The outlet of the level is ahead of the sign. Donkey Kong leaps to the letter "N". K: After passing the first group of Klumps, the primates drop onto a platform with the letter K above it. O: The letter O can be found in a pit next to the final platform before the Star Barrel. N: The primates find the letter N being circled by a Zinger as they travel along the second platform from the Star Barrel. G: Near the end of the level, the Kongs can find the letter G above a black platform that pulls them eastwards towards the final black platform in the level. When the Kongs land on the level's first moving platform, they should walk left and fall off it. They end up landing on a hidden platform directly below where the first platform started, which leads them to a barrel that takes them to the first Bonus Level. Here, they need to hit four barrels so that the K-O-N-G Letters displayed on them all spell out "KONG" in the correct order. If they do it correctly, they are given an Animal Token of Expresso or a Red Balloon. Afterwards, the primates return to the main level. If they fail to spell out the word correctly, they are forced out of the level without a prize. 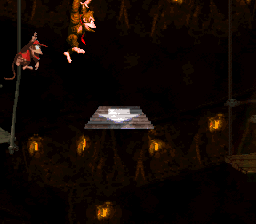 On the very last platform in the level, occupied by a Gnawty, the primates are taken downwards. Instead of jumping to the scaffolds to the right, they should continue to hover downwards and find a hidden scaffold. If they jump on this and head a little bit farther, they can find a barrel. It takes them to the final Bonus Level in the whole game, where they have to watch as an Animal Token of Enguarde moves around four barrels. Once it stops, it disappears, and the Kongs need to choose which barrel it stopped on. If they choose correctly, they are given the token. After they claim their prize, they exit the bonus. They are forced out of the stage without a prize if they fail to choose the correct barrel. DK falls with a platform between the letter "O" and the level's photograph. A camera icon is located to the left of the letter O. A super-jump is required to reach it. Once they grab it, they gain a photograph of a Krusha in the third page of their scrapbook. This page was last edited on April 13, 2019, at 14:43.